Development in higher order organisms commences at conception and continues into old age. With every stage of development, changes in the physical properties of cells and tissues takes place. In some cases these changes result from fluctuations in the biochemical or metabolic activity of cells, however in other cases, changes in the physical microenvironment drive the biochemical and genomic changes within cells. In the earliest stages of development, when the tissues are still taking shape, the physical properties of the microenvironment can direct cell differentiation, and initiate the coordinated movement of groups of cells to establish the patterns that will define how the body is arranged. Later, as tissue integrity is impacted by years of use, damage through injury or disease, and subsequent repair mechanisms, the physical properties of the cellular microenvironment will have drastically changed. These changes can lead altered cell behaviour, that at times leads to the onset of disease. The importance of the physical microenvironment of cells in development is most prominent in the earliest stages of development, which are collectively referred to as embryogenesis. Hence, much of this topic will focus on the cellular and biophysical processes that take place during embryogenesis. Embryogenesis, starts with the fertilization of an egg cell by a sperm cell and the fusion of their genetic material to form a single-celled zygote. Following fertilization, the zygote repeatedly divides to form a multicellular embryo, in which cells migrate and differentiate to form rudimentary organs. Despite the astounding diversity in life forms within the animal kingdom, the developmental mechanisms adopted by almost all vertebrates as well invertebrates remain surprisingly similar, particularly during the initial stages. As a result, much of our knowledge on mammalian embryogenesis has come from studies carried out using invertebrates such as the nematode worm, C.elegans and the fruit fly Drosophila, as well as simple vertebrates like zebrafish. These model organisms have led to fundamental discoveries about the role of genetics, and more recently, mechanical forces in development. A basic scheme of development highlighting the common steps that occur during embryogenesis, is briefly described here. During fertilization, the genetic materials of the sperm and the egg fuse, giving rise to a single-celled zygote. The zygote immediately undergoes successive rounds of mitotic divisions, without any significant growth, to form a dense cluster of cells that differentiate and organize into a spherical structure called the blastocyst. This process is known as blastulation. The blastocyst is characterized by an outer trophoblast layer that surrounds a fluid-filled cavity called a blastocoel, and an inner cell mass, known as the embryoblast, that clusters at one end of the blastocyst. The inner cell mass contains the precursor cells required for the formation of the embryo. These percursor cells divide and migrate into the three germ layers- ectoderm, mesoderm, and endoderm- during the process of gastrulation. These three germ layers seed the development of all the critical organs and the pattern of the organism begins to emerge. 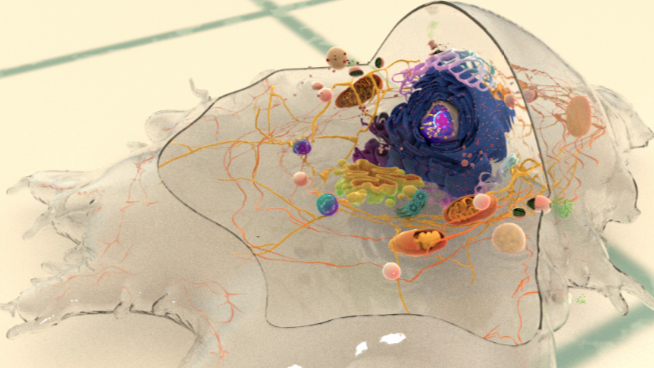 In multicellular organisms, the developmental programs originating within a small group of cells are coordinated across entire tissues or organs through mechanical connections between neighboring cells. These cell-cell adhesions, which are essential for maintaining the structural integrity of tissues, arise at different stages of development in different organisms. For instance, in mouse embryos, adhesions start forming during the 8-cell stage and are fully established at the 32-cell stage . However, in Drosophila embryos, adhesions form much later during the blastoderm embryo stage when the embryo already exists as a large syncitium containing more than 1000 nuclei . The stability and dynamics of cell-cell adhesions are to a large extent mediated by their linkages with the contractile actomyosin network underneath the plasma membrane, and it is through the integration of adhesion and contractility that the various morphogenetic processes during development eventually take place. With the cell-cell adhesions established, contractile forces generated within cells can be transmitted across an entire tissue. This is essential, for example, in driving cell sheet bending, which is a key step in morphogenesis that sets off events such as mesoderm invagination and the formation of germ layers . The importance of this was illustrated in a study involving live cell imaging of Drosophila embryos . Here, non-muscle myosin-II was found to accumulate at the apical-medial position of mesodermal cells, and form long actomyosin fibers that spanned the apical surface. These fibers linked the cell-cell adhesions and induced apical constriction, which leads to shape changes in a central band of mesodermal cells as well as the invagination of the mesoderm during gastrulation. When these linkages were disrupted, the apical constrictions could not be efficiently linked to the membrane, and this resulted in a failure of mesodermal invagination . Similar coupling between the apicomedial actin-myosin-based contractility and apical cell-cell adhesions were found to be essential for driving cell shape changes during gastrulation in C. elegans . Such studies have provided better insights into the biomechanical processes underlying force generation in cells, and how their integration across cell sheets effects tissue shape changes, leading to the formation of organ shapes and body patterns. Equally important to cell-cell adhesions, are the interactions between cells and their microenvironment- the extracellular matrix (ECM). Synthesized by cells, the polymers and proteins that comprise the ECM gradually evolve into a dense scaffold as more and more proteins are produced. In return, the ECM provides a multitude of signals to cells, which can be structural, physical, biochemical, or electrical in nature. Together, these signals play a key role in regulating a number of cellular processes, including division, migration, and differentiation . 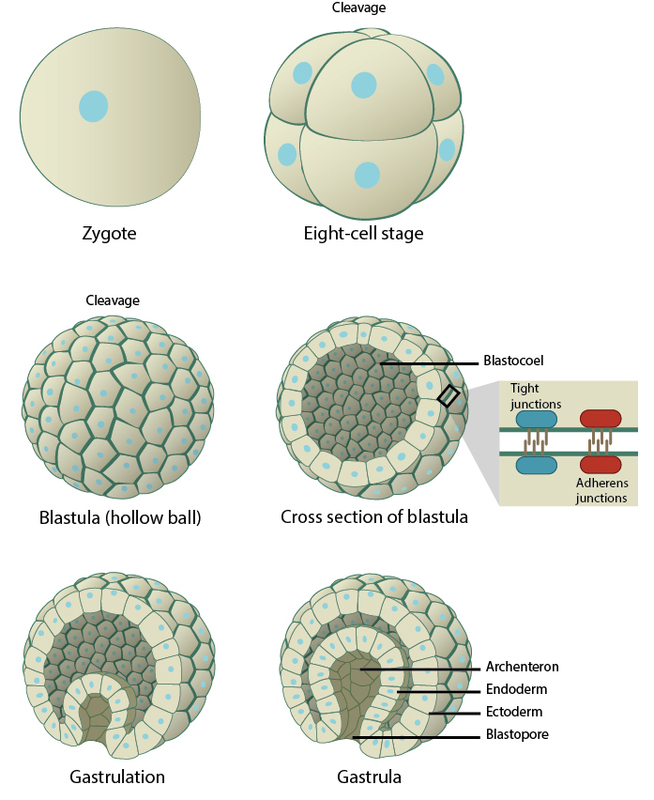 Cellular differentiation is a critical process during embryogenesis, in which self-renewing cells called embryonic stem cells arise from the inner cell mass of the blastocyst and specialize into distinct cell types and forms the three germ layers, from which all the organs of an organism are ultimately derived. These embryonic stem cells are pluripotent, i.e., they possess the ability to differentiate into all cell types in the body. One of the defining characteristics of pluripotent stem cells is that, they have a highly flexible nucleus and dynamic chromatin organization, allowing them to express a wide array of proteins and respond to diverse signals arising from their microenvironment. This nuclear flexibility in embryonic stem cells confers a significant mechanical advantage during morphogenetic events when cells must squeeze through narrow spaces in the developing tissue. However, as the embryo develops, the nuclei becomes less flexible as a consequence of internal structural reorganizations, including chromatin condensation, nuclear lamina remodeling and nucleoprotein immobilization , . These changes ultimately result in stiffening of the nucleus and rigidification of the genome, which defines the gene expression pattern for each cell and establishes a state of differentiation . A number of recent studies have definitively confirmed how mechanical signals arising from the ECM directly regulate cellular functions such as proliferation, differentiation, and survival. One key study demonstrated the influence of microenvironment rigidity on directing stem cell differentiation. Human mesenchymal stem cells (MSCs) cultured on soft, collagen-coated gels mimicking brain tissue differentiated into neuronal cells, whereas on a stiffer ECM mimicking striated muscle tissue MSCs differentiated into myoblasts, and increasing the ECM rigidity to mimic bone resulted in MSC differentiation into osteoblasts . These findings were corroborated by another study, where mouse embryonic stem cells grown on stiff PDMS substrates displayed enhanced gene expression during gastrulation and early mesoderm differentiation, as well as enhanced terminal differentiation into osteocytes . In addition to ECM rigidity, the role of mechanical signals such as substrate topographies were investigated by culturing human embryonic stem cells on a synthetic multi-architectural chip that contained a range of topographies which varied in geometry and dimensions. The findings from the study show that anisotropic patterns such as gratings drives neuronal differentiation but the same stem cells differentiated into a glial lineage when grown on isotropic patterns such as pillars and wells . Such studies underline the fundamental role for mechanosensing during the various stages of embryonic development. Two major morphogenetic events, epithelial-mesenchymal transition and collective cell migration, clearly highlight the role of mechanotransduction in regulating cellular organization and behavior during development. In the case of the former, cells to transition from an epithelial to mesenchymal state, or vice versa, depending on the stage of embryogenesis. The formation and strength of cell-cell adhesions play an important role in these transitions. Epithelial cells often form a protective barrier, and are characterized by multiple cell-cell adhesions which allow for maintenance of integrity and polarization. Loss of these cell-cell adhesions is a hallmark of transformation into mesenchymal cells, which can detach from the epithelial cell sheet for migration and differentiation. Collective cell migration, which is the coordinated and directional movement of clusters of cells, is fundamental to morphogenetic events during development. In embryonic tissues, collective cell migration relies on vital guidance cues obtained from the interaction of cells with the ECM, and the formation of adherens junctions between cells. These cell-cell adhesions serve to keep the cells connected to each other to maintain the integrity of the cluster, and facilitate mechanotransduction that allows the cluster to dynamically move and remodel in response to the environmental cues. Epithelial cells, such as those constituting the Xenopus lateral lines, Drosophila tracheal tubes, and the border cell clusters that surround the Drosophila egg chamber, migrate as highly cohesive sheets connected by stable cell-cell adhesions. In contrast, mesenchymal cells such as neural crest migrate in a loosely-organized manner to localize to various sites within the embryo, and are held together by transient adherens junctions . An important feature of collective cell migration is the front-rear polarization of the cell cluster, in which some cells assume the role of leader cells at the front end and actively form protrusions. These protrusions which generate traction forces against the extracellular matrix that move the cell cluster, and also sense any extracellular signals that may help in guiding the directional migration . This is very similar to the role of protrusions formed during single-cell migration. For instance, during the epithelial tube morphogenesis in Drosophila trachea, tracheal cells with the highest levels of Btl (the receptor that responds to the guidance cue ligand, Bnl) assume leader positions and form protrusions, which drive collective cell migration and tracheal branching. The remaining cells in the cluster assume the role of follower stalk cells which undergo intercalation and contribute to the further elongation of the branch . An understanding of the mechanical connection of cells during migration and their response to guidance cues will reveal the finer details of the morphogenetic events taking place in development. More importantly, given the morphological and behavioral similarities between collectively migrating cell clusters and metastatic cancer cell colonies, understanding embryonic migration will also provide insight on the mechanical principles underlying cancer metastasis and invasion. There also exist various biomechanical feedback mechanisms where the mechanical strains and stresses associated with morphogenetic events can, in turn, regulate cellular behavior including growth, proliferation, differentiation, and motility. For instance, ex vivo artificial deformation experiments on Xenopus early embryos has revealed how mechanical stresses during morphogenesis leads to shape changes in the tissue, as ventral ectoderm cells responded to stretching by undergoing autonomous elongation in the direction of stretching, along with active contractions in a perpendicular direction . Similarly, another recent study on tissue growth in the Drosophila egg chamber- an organ that comprises of an epithelial layer enclosing a germline cyst- revealed that epithelial actomyosin contractility is activated in response to mechanical stresses generated during germline cyst growth. The actomyosin feedback is also essential to maintain epithelial shape and to regulate localized proliferation of the epithelium during oogenesis . Therefore, understanding how the various stages of embryonic development are influenced by mechanical properties of the cellular environment and how cells have, in turn, developed mechanical feedback mechanisms during developmental programs will reveal finer, specific details of the fundamental principles underlying evolutionary biology. How does the vascular system form?